As soon as the weather starts getting cool my memories take me back to the city of Toluca. But particularly to a small restaurant, we used to go for brunch on Sundays. They only served stews made from all kinds of meats with Tomatillo sauce. The stew was served in a bowl which has about a 1/2 cup of pinto beans with its broth at the bottom and the stew of meat and tomatillo sauce on the top. Add a spoon and stack of handmade corn tortillas and you are in heaven. Just thinking about it makes my mouth water. This is a very versatile recipe because you can also use pork or chicken, as well as add vegetables like zucchini, green beans, or any other vegetable you have on hand. And why do I think about Toluca when it starts getting cold? Well, the city has this sort of “sweater” climate almost year around. Toluca is a city in the Estado de México. Very close to the other México, the city, the capital of the country. The City of Toluca sits at an altitude of 8,973 Ft above sea level and has an average temperature of 54 degrees Fahrenheit, it varies from mild, cool, cold and very cold depending on the season. The city is famous for the red and green chorizos made in the region. Add the short ribs to the pot and brown well on all sides, place the dry and toasted avocado leaves back into the pot. Add 1/2 cup of water and place the lid. Cook over medium heat for about 1 1/2 hours or until meat is fork tender. While the meat is cooking, prepare the sauce.Place a griddle over a medium-high heat and roast the tomatillos and garlic cloves turning occasionally until they are charred about 10 minutes. Place the Arbol peppers on the griddle and lightly toasted them. This will take a few seconds. Place the chopped cilantro, peppers, garlic peel removed, tomatillos and the meat juices in a blender. Process until combined and smooth. Remove the meat pieces from your pot and add the sauce, simmer the sauce for 5 minutes and bring back the ribs to the pot. Keep cooking for 8 more minutes. Add some beef stock if needed. With the help of 2 forks shred the meat a bit and incorporate with the sauce. Add salt and pepper to taste. Serve with warm corn tortillas and white rice or pinto beans. 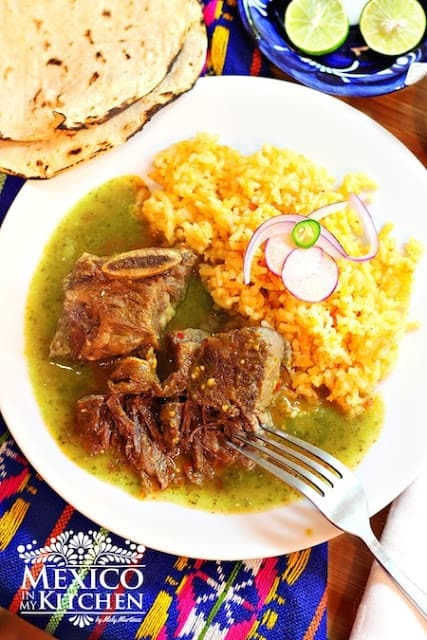 Braised Short Ribs in Tomatillo Sauce, this is a very versatile recipe because you can also use pork or chicken, as well as add vegetables like zucchini, green beans, or any other vegetable you have on hand. A delicious and elegant dish that’s perfect for a nice dinner. Heat a large pot over medium-high heat and add the avocado leaves if using. Slightly toast them for a few seconds per each side, they will release their aroma and turn a little brown. The addition of the leaves will give enhance the flavor of the stew. Remove from the pot to add the ribs. While the meat is cooking, prepare the sauce.Place a griddle in a medium-high heat and roast the tomatillos and garlic cloves turning occasionally until they are charred about 10 minutes. Place the Arbol peppers into the griddle and lightly toasted them. This will take a few seconds. Place the chopped cilantro, peppers, garlic peel removed, tomatillos and the meat juices in a blender. Process until combined and smooth. Discard the avocado leaves, I also remove the rib’s bones after they are cooked. And now… who wants to join me for dinner? So happy I found ur web site Mely made the Costilla de Res in salsa verde for my family & loved it very much lots of flavor will definitely try more of ur recipes ???????????? Made this for dinner last night and before we where done eating my 5y/o was asking if we could have leftovers tomorrow! The recipe is very simple and easy. Going to put this one in the regular rotation for dinner. Thanks for sharing. .
Just discovered your website and tried this recipe last night as I love salsa verde. This was an amazing recipe. Will make it again when having friends over for dinner. Can't wait to try some other recipes. Thank you. This one turned out awesome. Thanks Mely!